Watching more hockey is the kind of New Year’s resolution that’s easy to keep – and the first week of 2019 saw a record number of fans coming to KHL games. They got to see first hand some of the young prospects named in Team Russia’s latest Euro Tour roster, with Ilya Vorobyov choosing a youthful party for next month’s Swedish Hockey Games. And, with the playoffs now less than a month away, three more teams confirmed their involvement over the past week. Russia’s roster for the upcoming Swedish Hockey Games – February’s phase of the Euro Hockey Tour – sees call-ups for three of the players who recently won bronze at the World Juniors. Sochi goalie Pyotr Kochetkov joins Ilya Vorobyov’s squad along with Lokomotiv forwards Grigory Denisenko and Kirill Slepets. The Loko youngsters are joined by four others from the Yaroslavl club, with Russia due to play Finland in the city on Feb. 7. Goalie Ilya Konovalov is back on the list along with forward Denis Alexeyev and defensemen Alexander Yelesin and Rushan Rafikov. Experience is provided by Dynamo Moscow duo Vadim Shipachyov and Dmitry Kagarlitsky on a bold and experimental line-up. Three more teams confirmed their playoff places this week. In the Eastern Conference, sixth-placed Salavat Yulaev booked its ticket after back-to-back wins over Kunlun Red Star. In the West, Lokomotiv and Jokerit, currently third and fourth, are also certain to be involved in post-season. The race for the remaining places in the West is tight. While Dynamo and Spartak Moscow are all-but assured of of top-eight finishes, it looks like any two from three for the remaining spots. Vityaz, in seventh and with 10 to play, is just four points clear of ninth-placed Dinamo Riga. HC Sochi lies between them, one point ahead of the Latvians. Riga and Sochi have nine games left. In the East, Torpedo and Traktor seem likely to fill out the bracket. With nine to play the Chelyabinsk men enjoy a seven-point advantage over Sibir and Neftekhimik, with Red Star two points further back. For the first time, the KHL trialled a special ‘smart’ puck. Combined with microchips in the players’ jerseys and sensors around the arena, this generated a huge stream of new statistical data about the game. And it turned out that the strict fitness regime of Barys head coach Andrei Skabelka really does make a difference – two of his players came top of the charts. Roman Starchenko was the fastest skater, reaching 37.1 km/h, while Darren Dietz covered more ground than anyone else, skating 6,112m in 40 minutes of hockey. “I was trying to burn off everything I ate this weekend,” the Canadian joked afterwards. “I wanted to keep the coach happy.” The new technology could soon be rolled out in all KHL games. The first week of action in 2019 saw a new record for fans at KHL games. The 22 scheduled games attracted 182,060 spectators, taking the weekly average over 8,000 for the first time ever in regular season play. The biggest crowds were in Minsk, with over 15,000 watching Dinamo play SKA and only a couple of hundred fewer going to the game against CSKA. Spartak twice attracted 11,000+ to its games, while Dynamo Moscow’s new arena opened in front of a five-figure crowd for the visit of Avtomobilist. The average crowd was 8,275, with 88% of available seats filled – another KHL record. The official logo for the 2019 playoffs was unveiled during the week. With less than a month to go before the puck drops on the decisive phase of the season, the new imagery was released to the public. 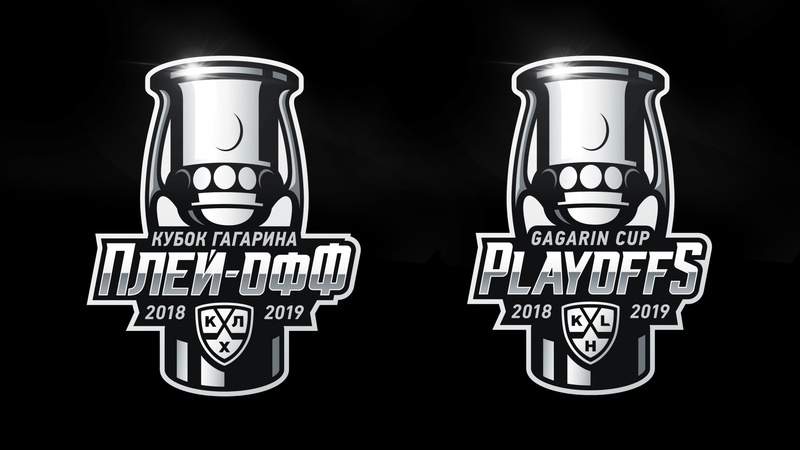 Based on the design of the Gagarin Cup itself, the text elements use an italic font to symbolize forward movement while the sharp outlines of the trophy are rendered in a metallic luster suggestive of the players’ skates. The post-season action starts on Feb. 25 with the Gagarin Cup final running to a potential game seven on April 25.